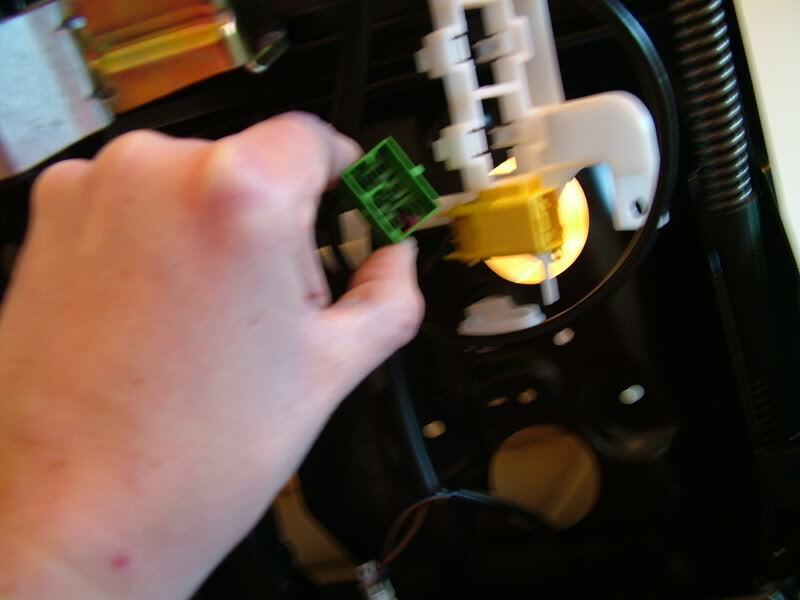 First, disconnect the negative lead from the battery, failure to do this will result in the Airbag light coming on. 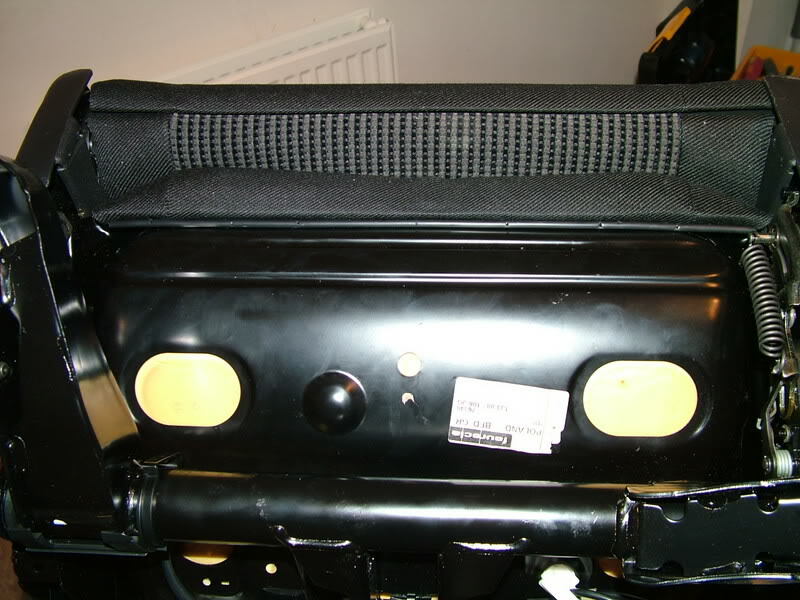 Slide the seat full forwards (in my case the Drivers side) and remove the two plastic caps and screws. 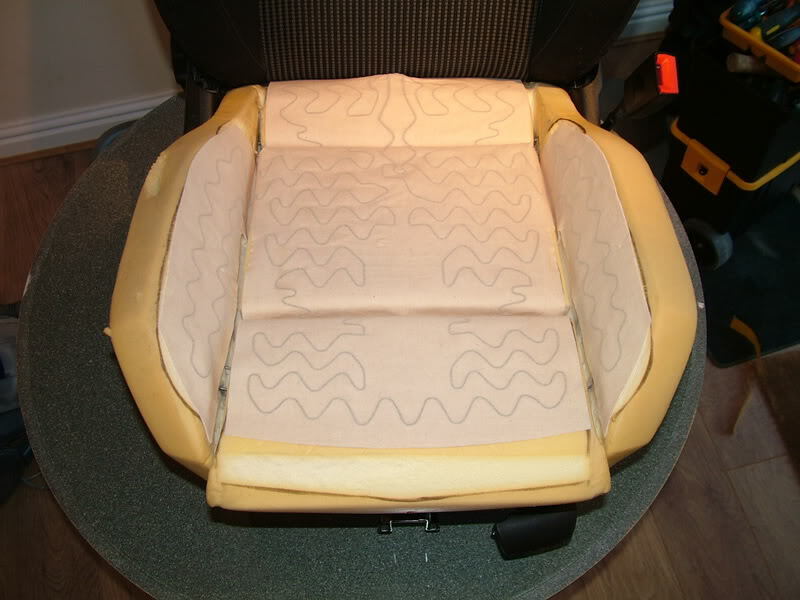 Slide the seat back fully back. 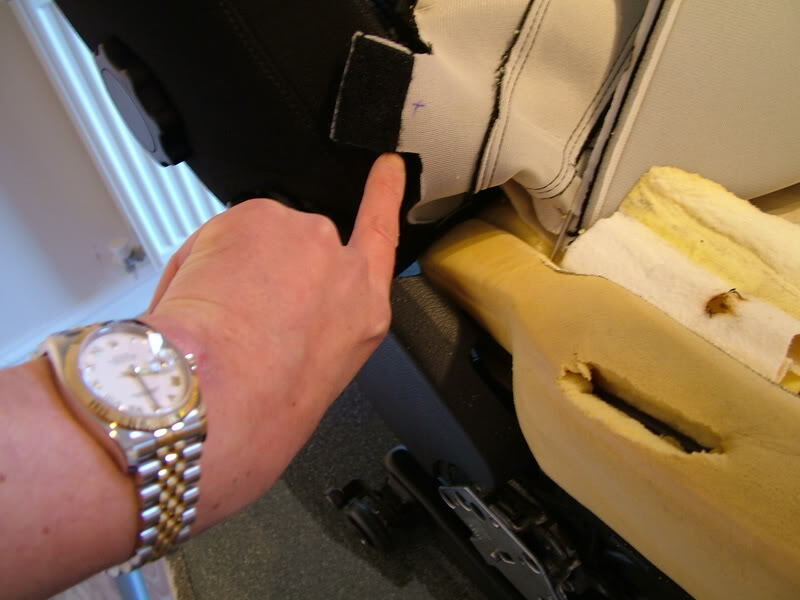 At the base of the front of the seat in the middle you will now see Two 13mm nuts, remove these, care in needed as these can be very tight. 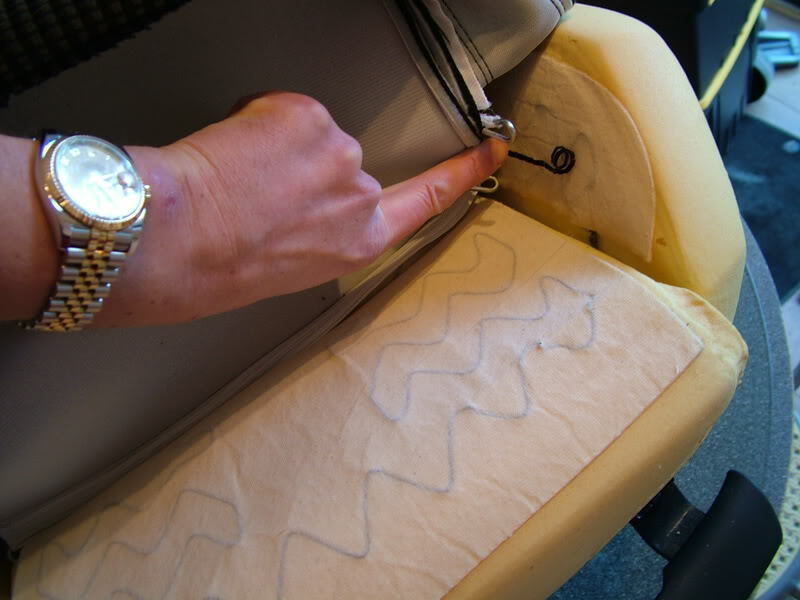 Carefully slide the seat backwards until the rollers at the back of seat appear out of roller housing. 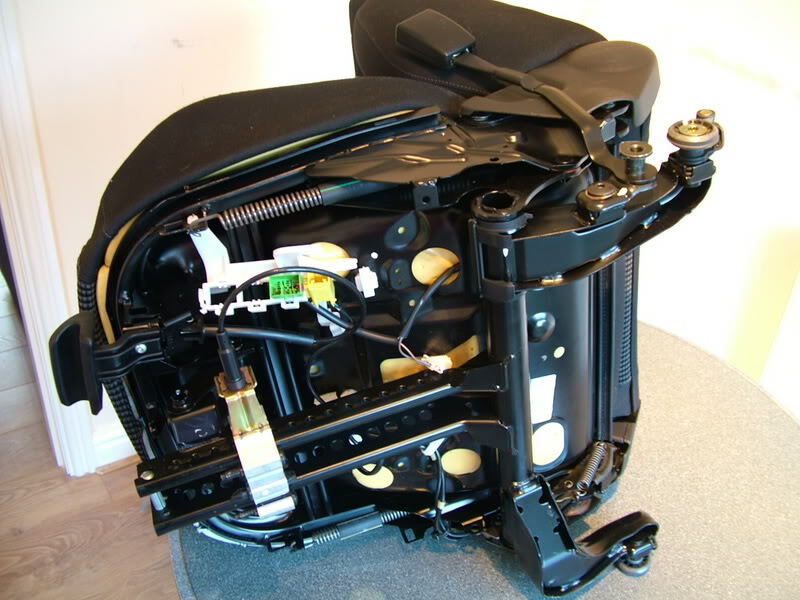 Tilt the seat from the front so that the wiring can now be seen. 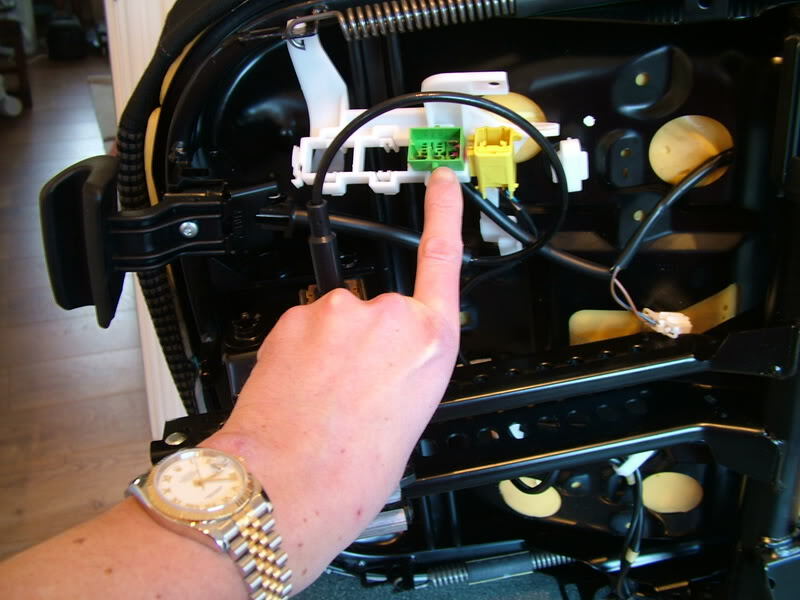 Disconnect the green plug (Heated Seat supply) and the yellow plug (Airbag supply) and the plastic retainer plug. 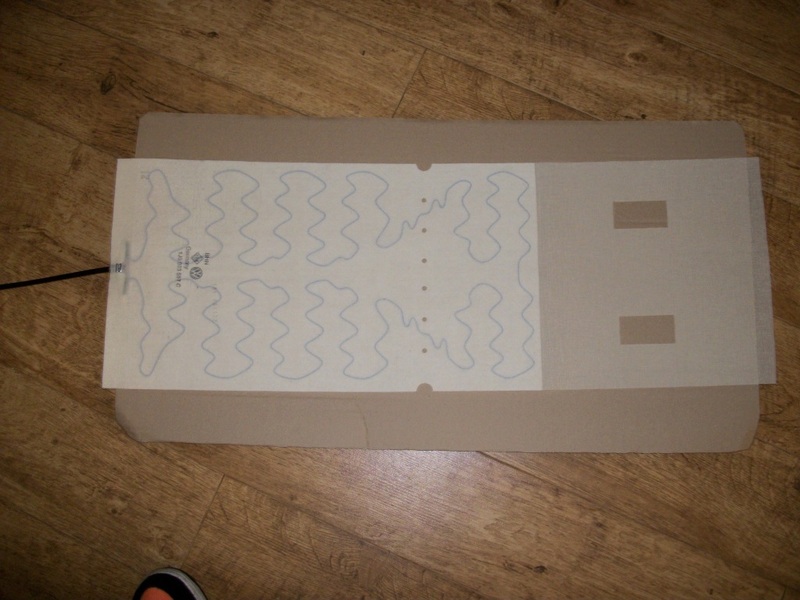 Move wiring loom out of the way. 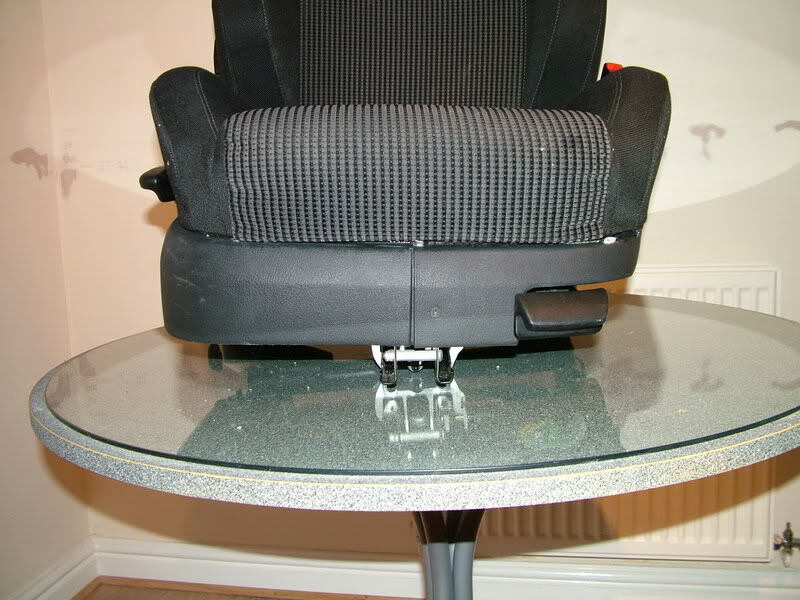 The seat can now be safefully removed from the vehicle. 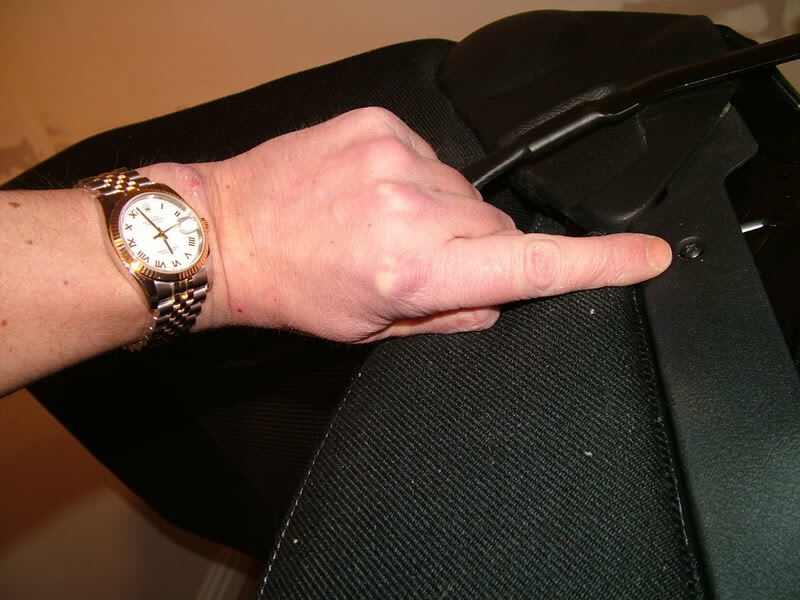 Remove screws from the side and front of seat and remove plastic trim. 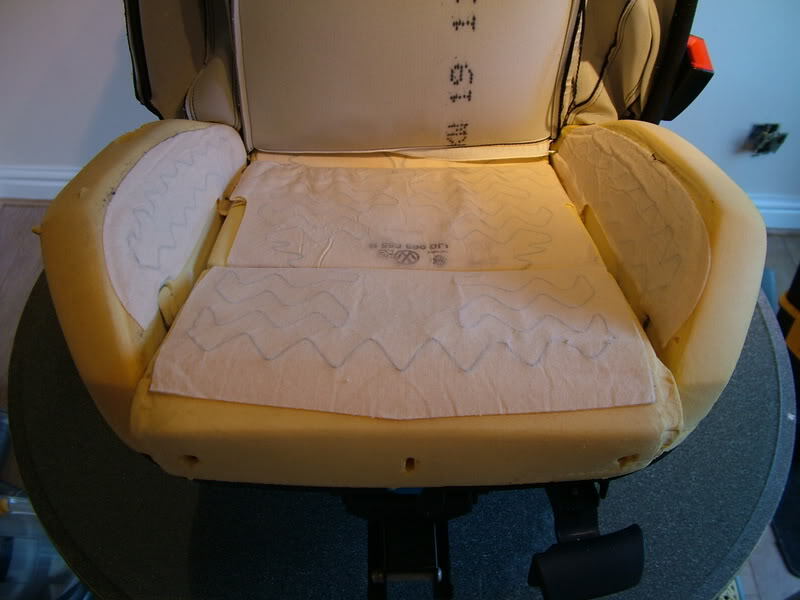 Once the plastic trims have been removed, the plastic strip at the front and back which holds the fabric onto the seat base can now be unclipped. 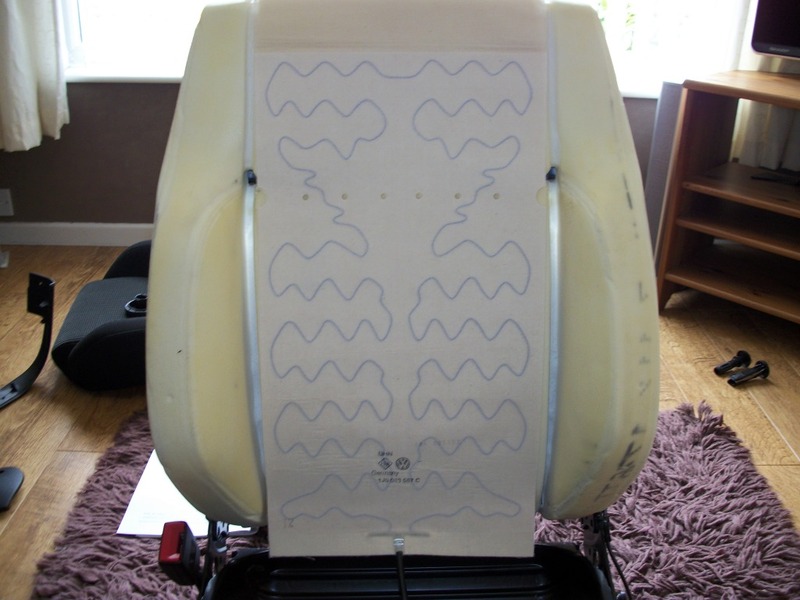 Once this has been done the fabric can then be peeled back to expose the metal retaining clips on either side of the seat base, unhook these using a pair of long nosed pliars but be extemly careful not to tear the foam cushion. 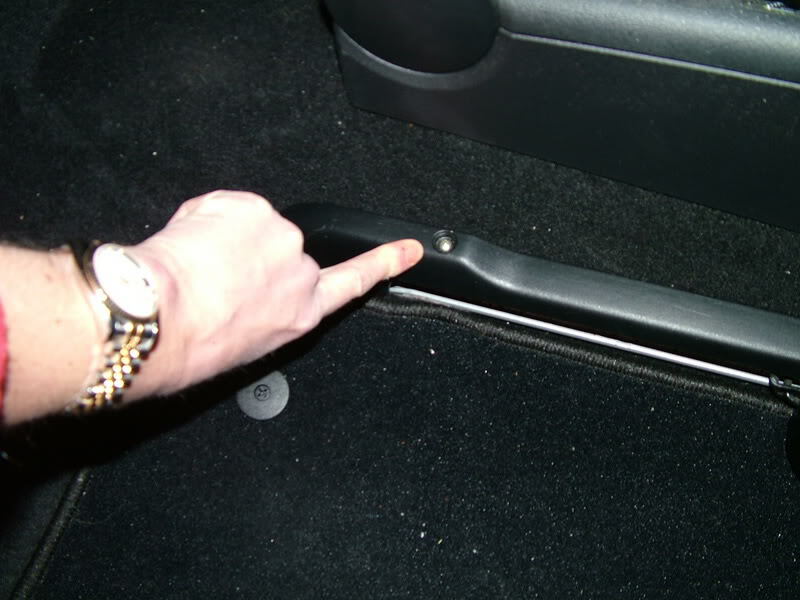 There are three metal rails that need to be unclipped. 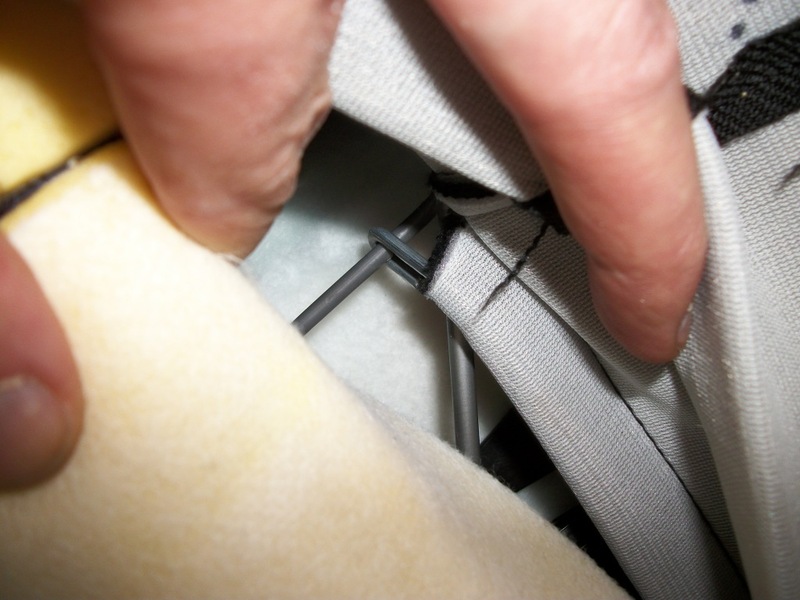 Remove fabric from velcro fastening from either side of seat cushion. 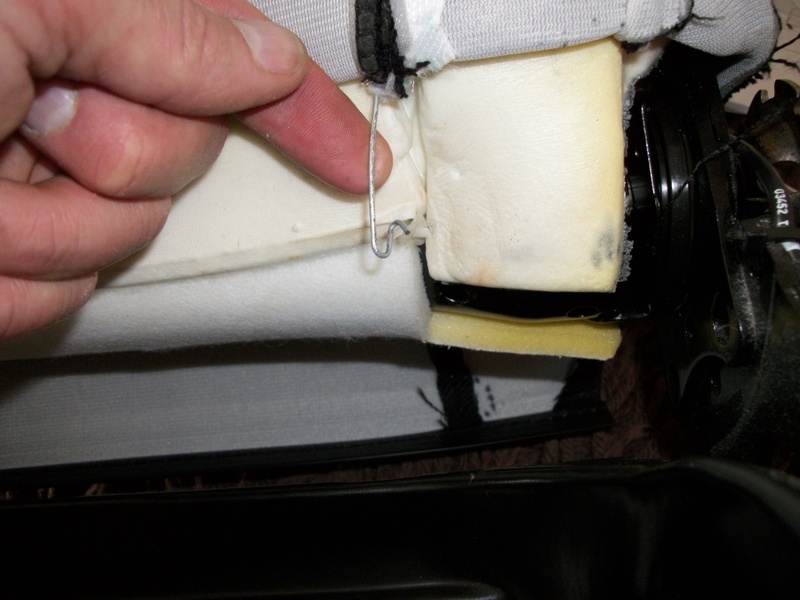 The fabric can now be fully removed. 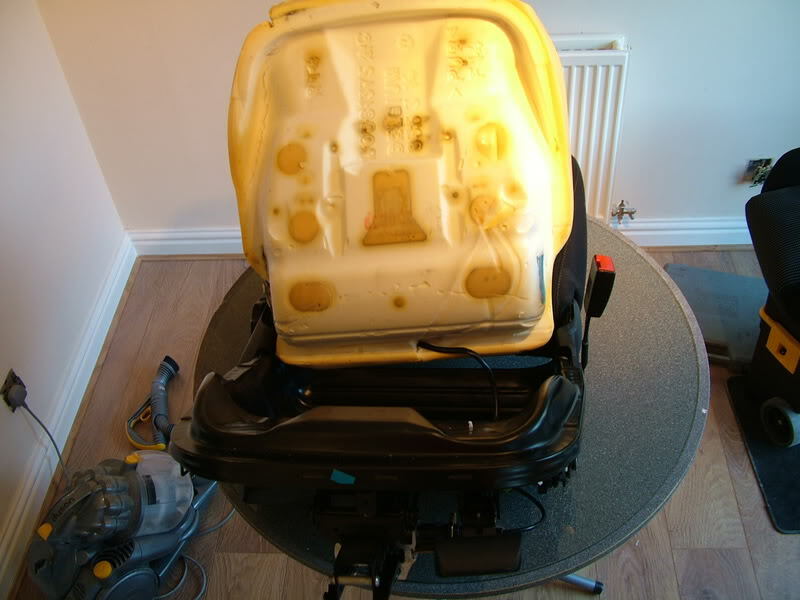 Note: The burnt patch where my element had failed and gone open cicuit. 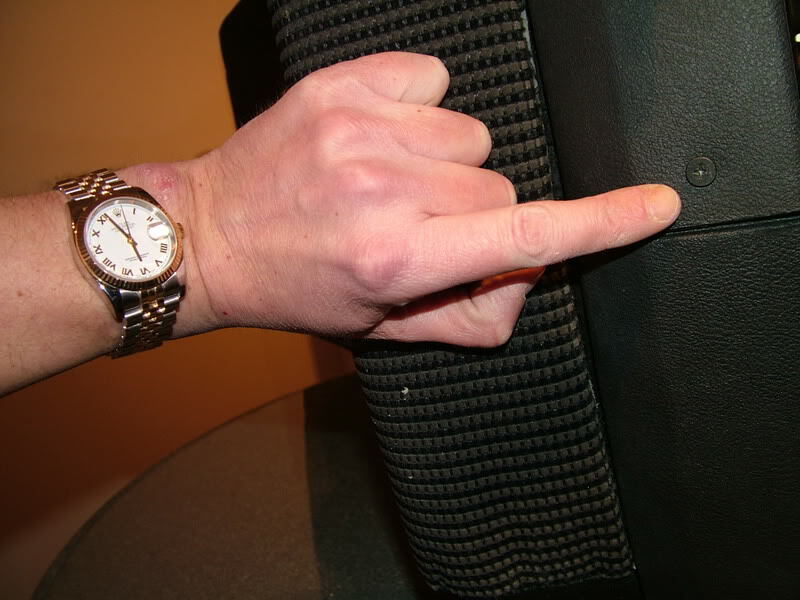 Tip: Mark around the seat elemnt with a marker pen, this will help when fixing in new element. 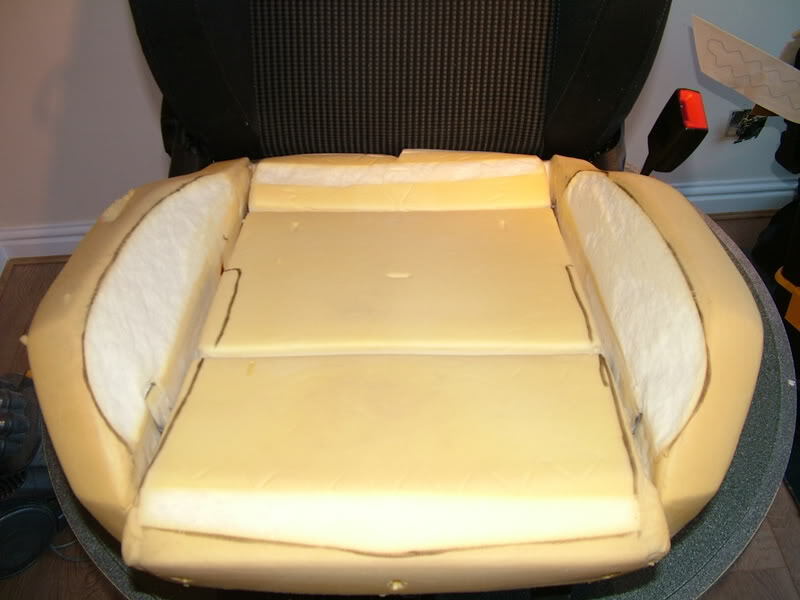 The old heated seat element can now be removed from the cushion, be careful not to remove too much cushioning as the Heated element is fixed in place by double sided sticky tape. 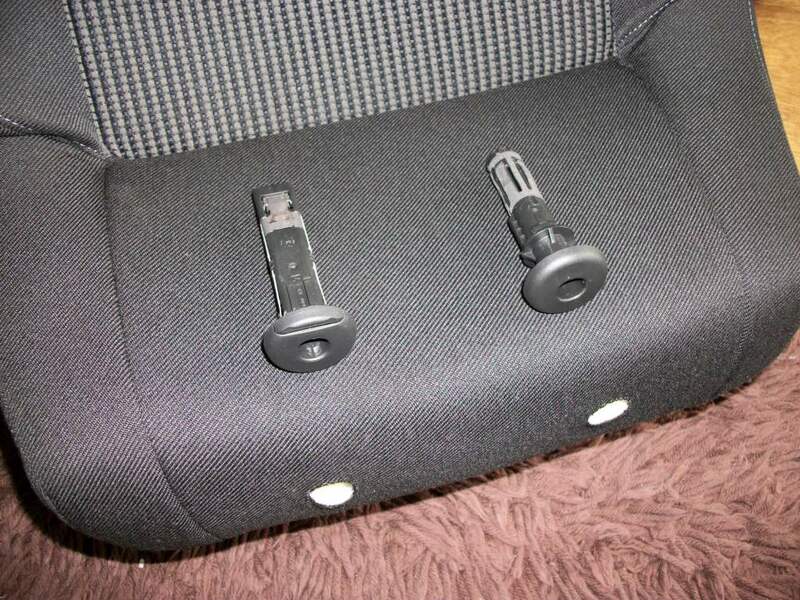 The cushion can now be completly taken out so the power plugs can be removed. 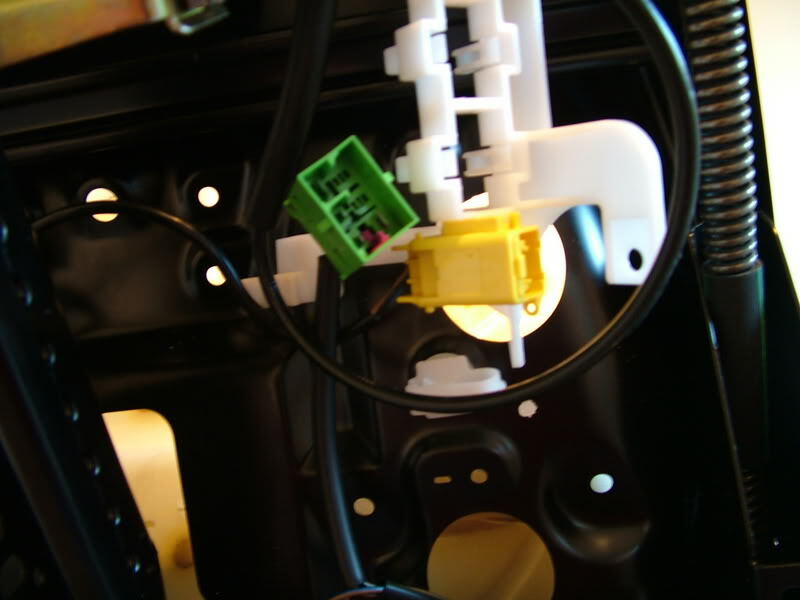 Disconnect the female side of the green connecting plug from base and push through to release, disconnect white plug from seat base (this plug is also the supply for the back seat element in seat. 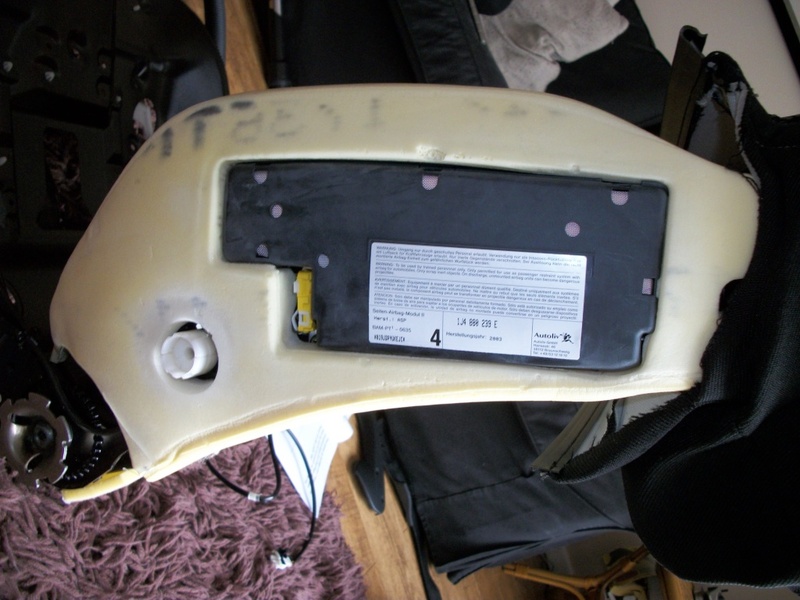 The element can now be completly removed and the new element is now ready for fixing in. 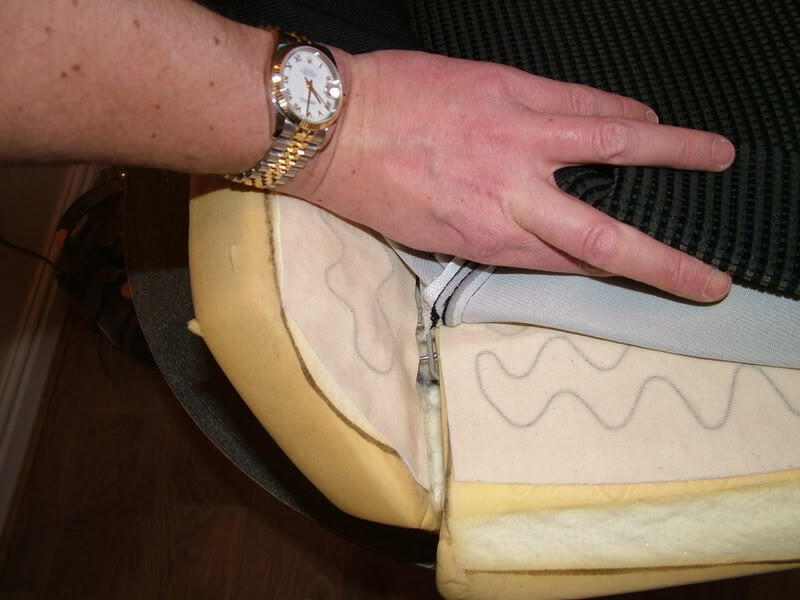 Carefully locate the new element in place allowing enough of the element to fix in between gaps in cushion, this will allow enough give in the stretching of the element once the seat is sat in. 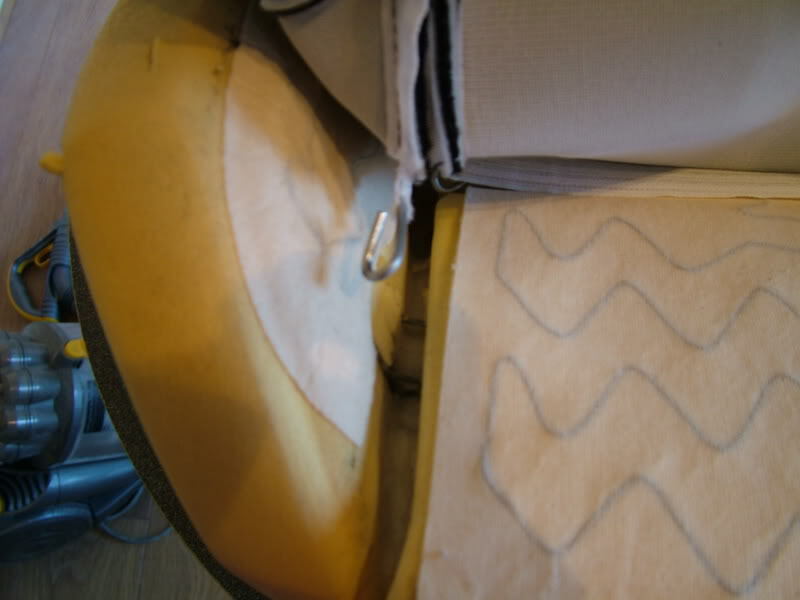 Remove paper stips to allow element to be glued in place and fix in place. 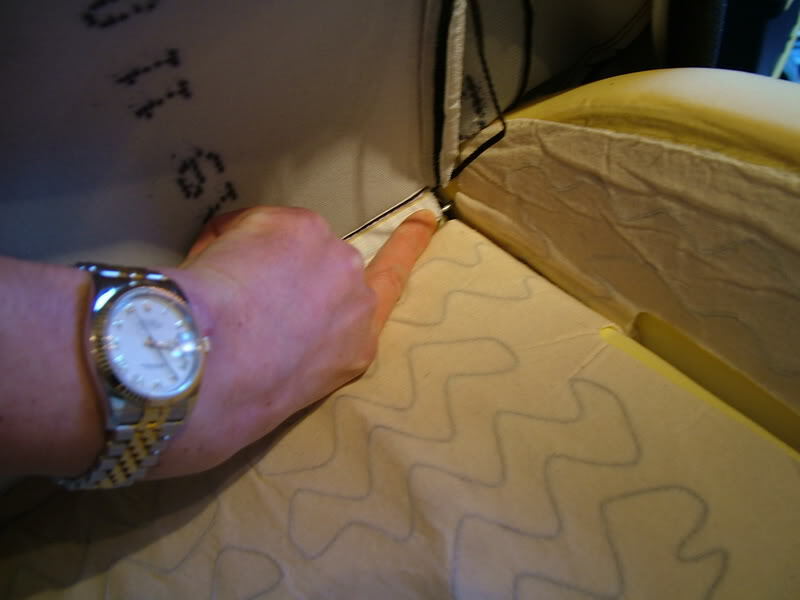 Reconnect the power plugs in place allowing enough cable at the back of seat for streching. 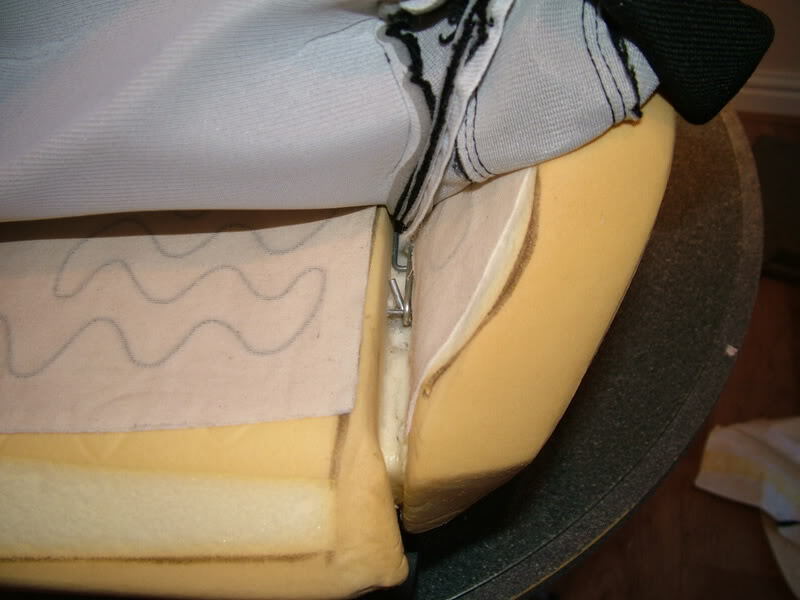 Refitting is basically a reversal of the above, be careful when reconnecting metal rails on seat fabric, this is a very tight fit. 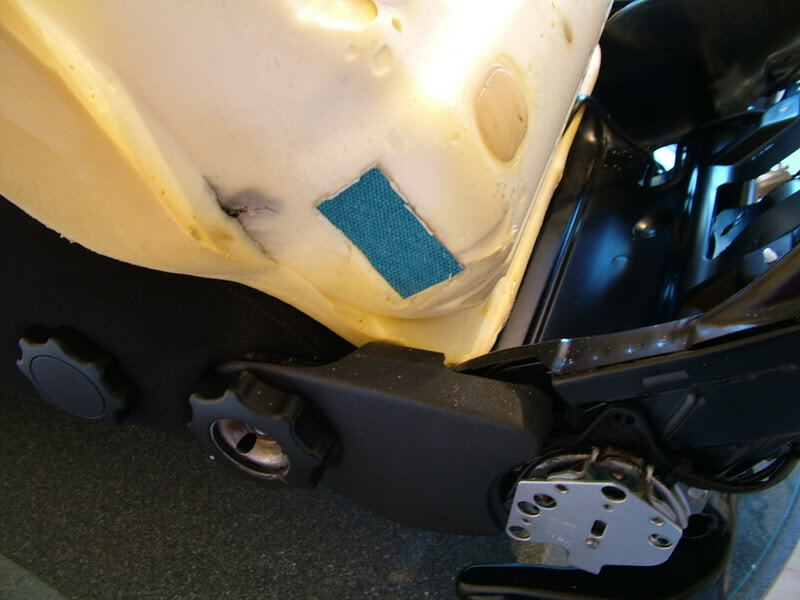 The plastic headrest supports removed. 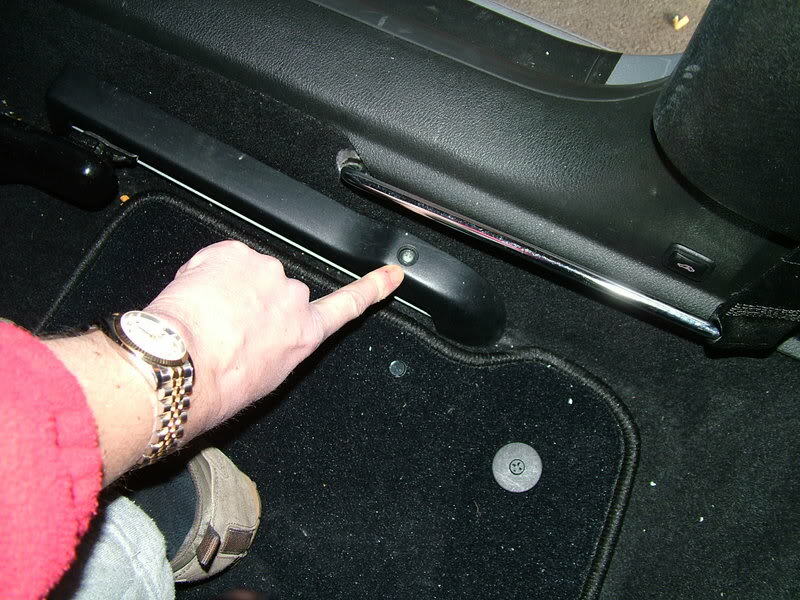 Just a good pull is all it takes. 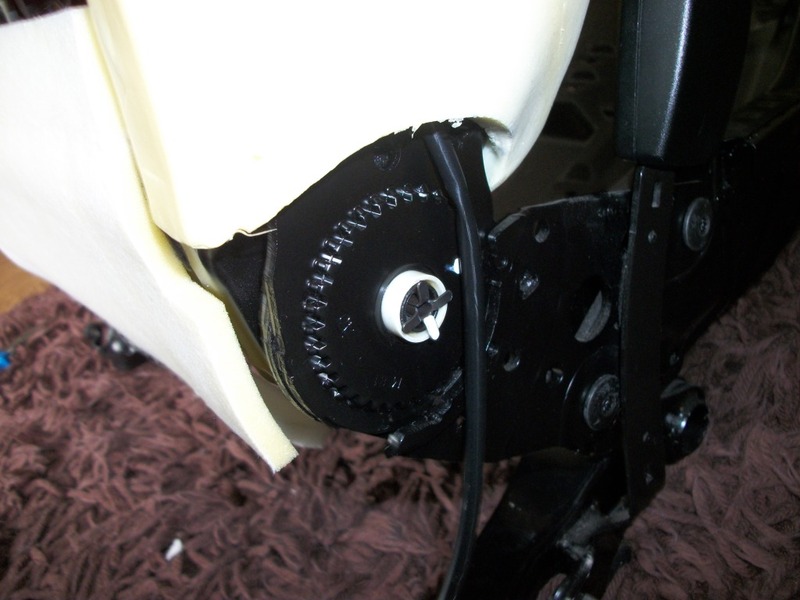 Clips at the bottom, 1 either side that keep the cover nice and tight. 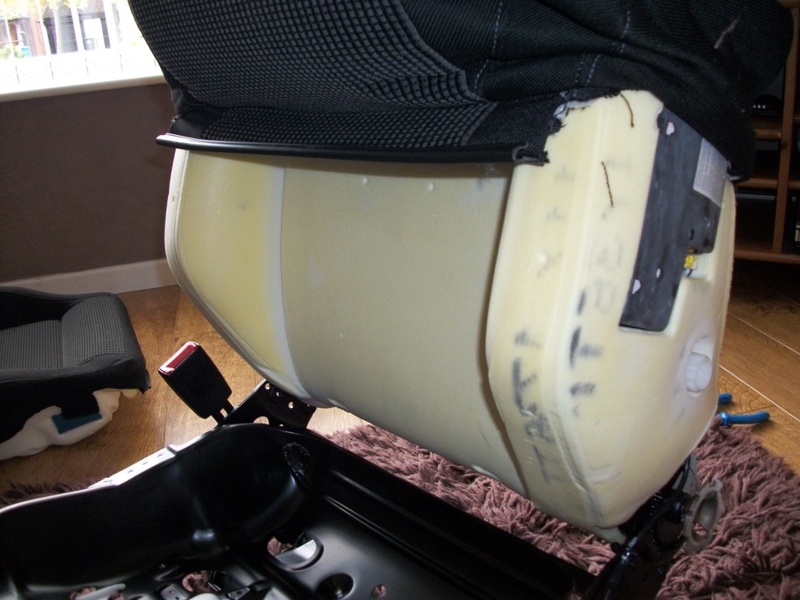 Clips about 3/4 up the backrest, again 1 either side. 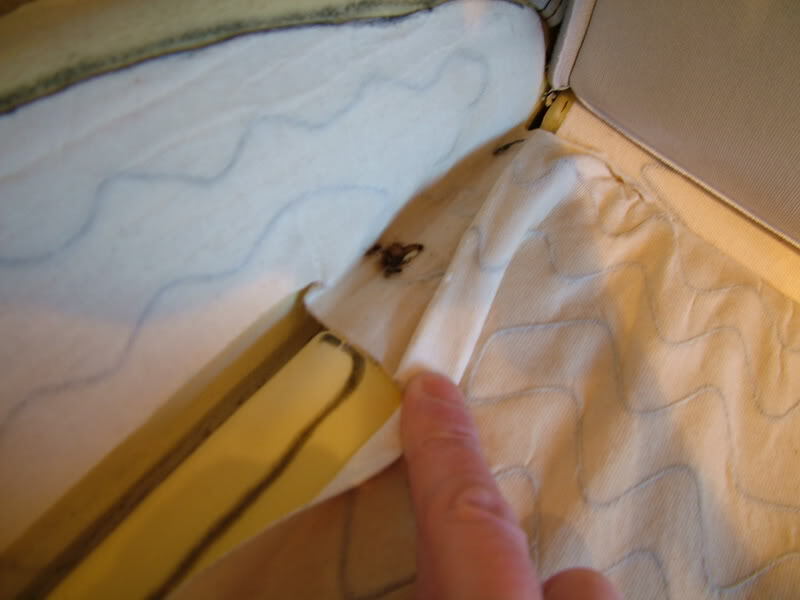 Sliding the cover off gently as you remove the clips. 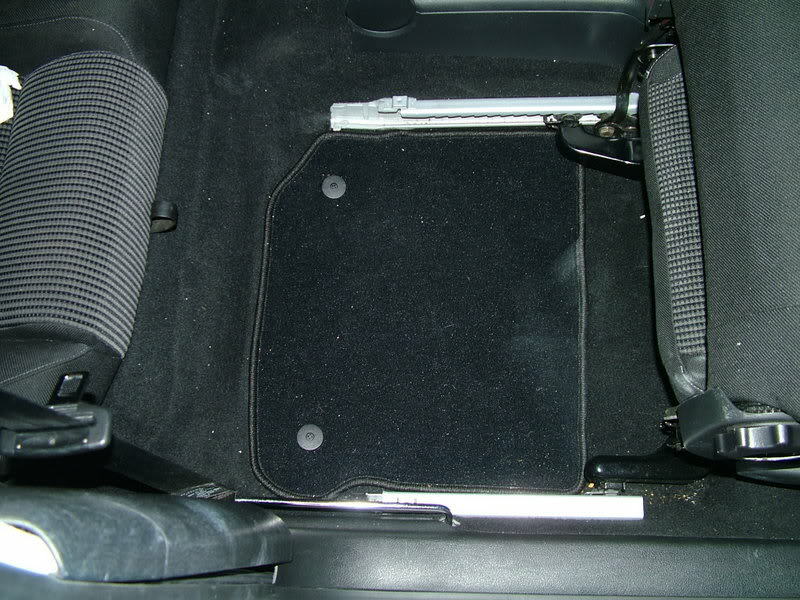 This gets quite tight at the widest point. 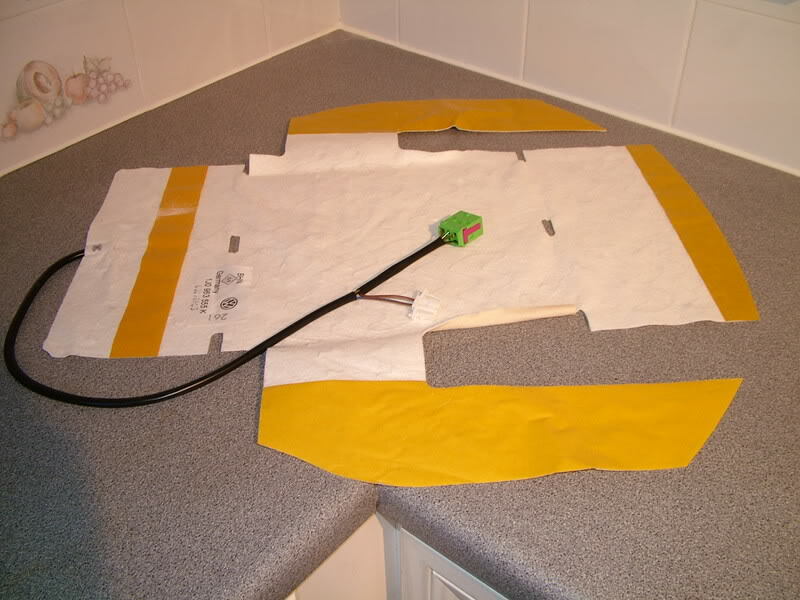 New heating element in position. 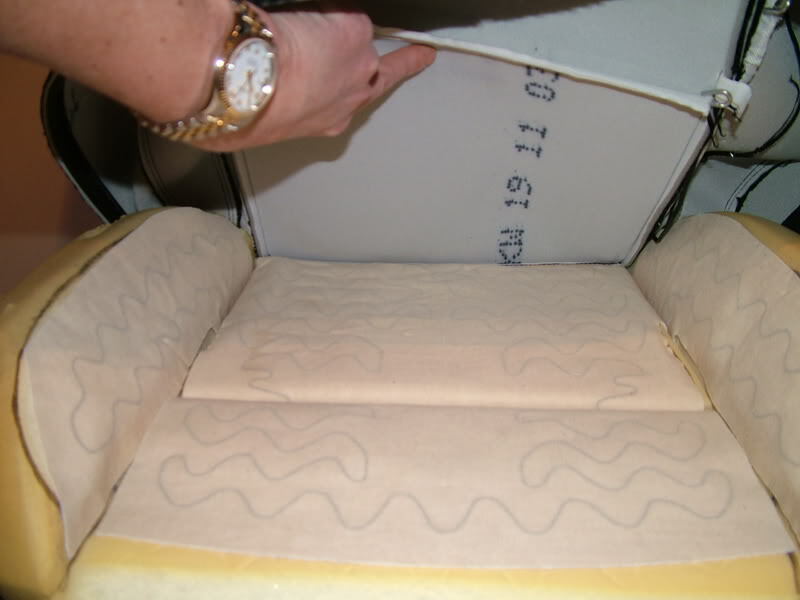 A hole needs cutting into the foam at the bottom to pass the cable through. 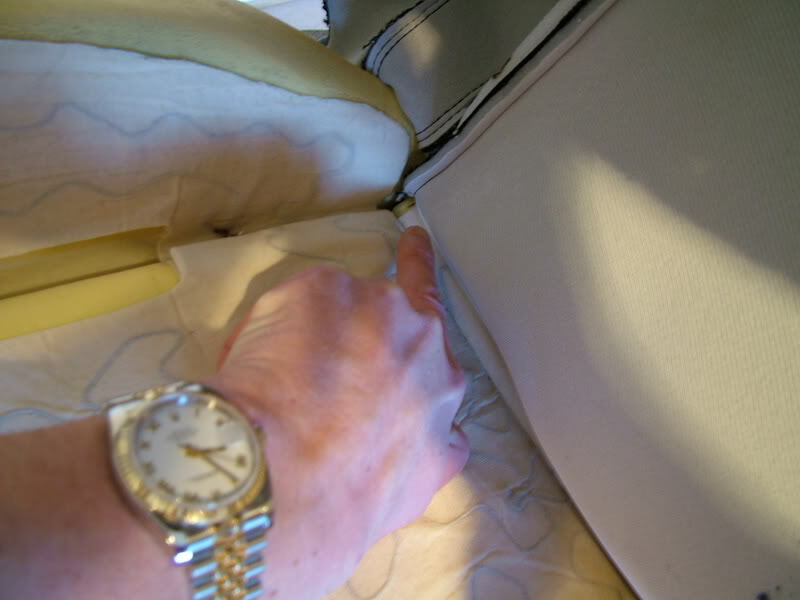 Pass the cable out through the side of the seat (opposite side to the airbag). 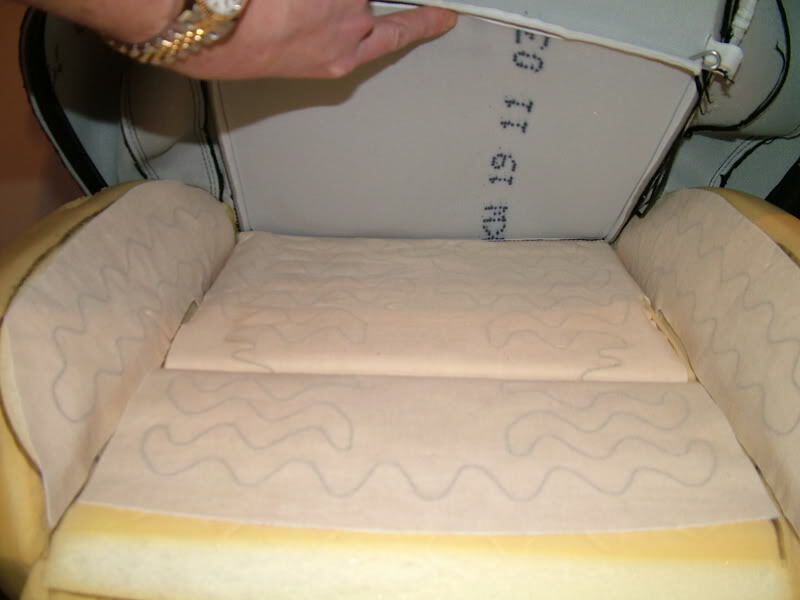 Just thought I'd throw in a pic of the airbag. Total time taken about 5 hours but time was allowed for taking these pics.